Klein Tools has expanded its “Tough Meter” Test and Measurement product line with the durable NCVT-3 Non-Contact Voltage Tester with Flashlight. It identifies AC voltage in cables, cords, circuit breakers, outlets, wires, doorbells, thermostats, low-voltage lighting systems, irrigation systems, and more. The rugged NCVT-3 non-contact voltage tester detects the full range of 12 – 1000V AC to accommodate both low- and standard-voltage environments.The rugged NCVT-3 non-contact voltage tester detects the full range of 12 – 1000V AC to accommodate both low- and standard-voltage environments. 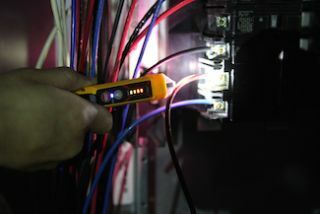 An integrated flashlight works independent of the tester and is practical enough to use as a standalone tool. By incorporating Klein’s “tough meter” standards of dustproof, waterproof, CAT IV 1000V safety rating and drop protection of up to 6.6 ft. (2m), this tool is suitable for any jobsite. For more details, including video, visit www.kleintools.com or your nearest distributor.